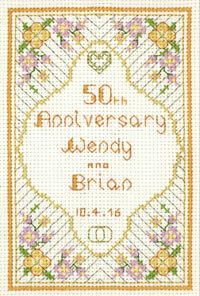 A Glitzy Golden Anniversary sampler to celebrate a 50th Wedding Anniversary. The border forms a delicate golden web overlaid with flowers in yellow and pink. There is a gold heart and joined gold rings with the name of the couple and date. A Glitzy Golden Anniversary sampler to celebrate a 50th Wedding Anniversary. A gold heart and joined gold rings are surrounded by a delicate golden web overlaid with flowers in yellow and pink. The name of the couple and the 50th anniversary date are added from the alphabet provided. This Glitzy Golden Anniversary Sampler cross stitch kit has only the best quality materials ~ Zweigart fabric, Anchor and DMC thread, silver thread, clear chart, needle. To add a personal finish a completion slip adds your name and date to the back of your work. You can add your own names and date using the full alphabet. This Golden Anniversary Sampler is kit is from the Decorative Textiles collection.